The cold nights are now drawing in, and what was once the heat of summer has become a wistful memory replaced by bitter winds and thick coats. This is certainly a time of year many of us start to yearningly dream of cosy nights in curled up on the sofa, wrapped in blankets, our hands being warmed by a big, steaming mug of hot chocolate whilst watching TV. But, of course, it is also a time for socializing, parties, family get-togethers, celebrations, shopping and gift-giving. No doubt we all have our own ideas of what makes it so special. 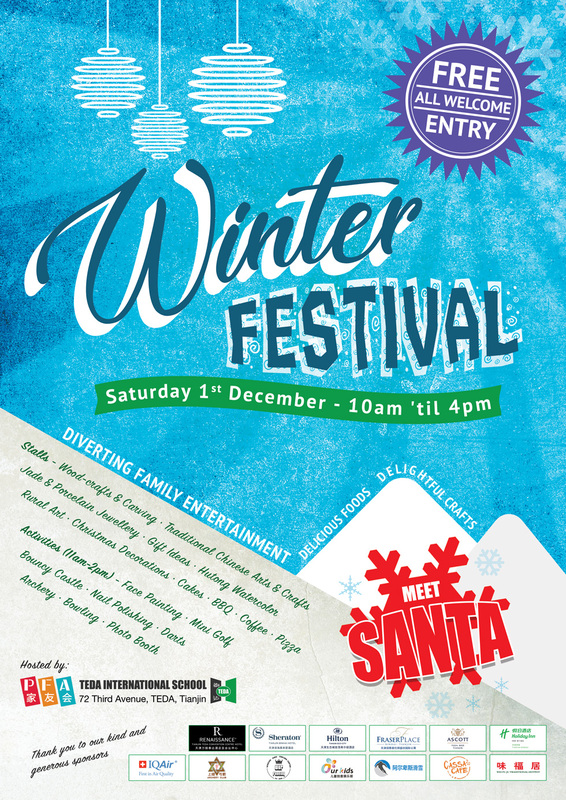 So, to really get this wondrous season off to a flying start, and to help get yourself into the spirit of things, come along to Teda International School’s annual Winter Festival on Saturday 1st December 10am-4pm. The festival is a marvelous mix of cultures, where the children can meet Santa while you buy Christmas decorations, or rummage around the plethora of stalls selling gifts, jade and porcelain jewellery, woodcarvings, and traditional Chinese arts and crafts. You can enjoy melodious festive songs warbled by our fabulous choir while you enter yourself into any number of our competitions, prizes for which include dining vouchers for some exquisite hotels in the local area. Take a quiet break and muse over some of the inspiring works of art in the students’ exhibition. When you get hungry or thirsty you can grab a cup of hot coffee, some food from the BBQ, a slice of pizza, or a delicious homemade cake. And while you digest and take stock of the festivities, you can release the kids into the gym so they can leap on the bouncy castle, get their faces and nails painted or try their hand at mini-golf, archery darts and bowling.